The ISS team assists patients with trusted options for tapering off and reducing dependence on opioids. Physical dependence to opioids is an expected physiologic response to use. 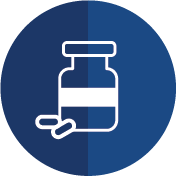 The ISS team provides patients with options for tapering off of or lowering their use of opioid medications, primarily through the use of buprenorphine products such as Suboxone and Zubsolv. Psychological counseling by a specialist is also included throughout treatment for patients dealing with chronic opioid addiction. Contact us to to learn more about our opiate dependence therapy treatment options.